I want to sustain part of L.D’s artistic spirit by sharing some of his works with others, so I plan on featuring selections here in the Tea periodically. 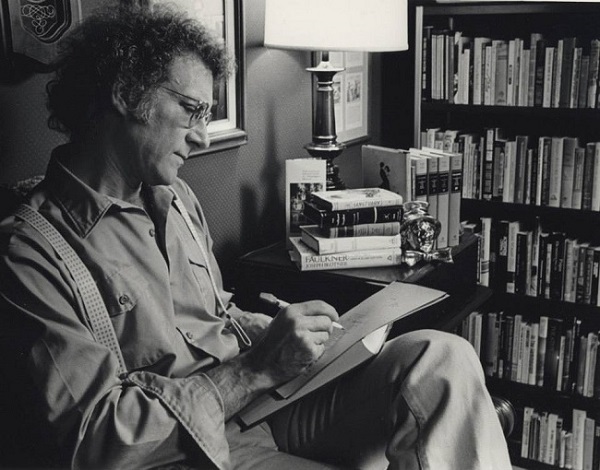 Below are several poems I transcribed from some of his key poetry books: At Water’s Edge, At Shore’s Border, Shadow War (volume 1 and 2), The World Waiting to Be, Rabbi Auschwitz, Unser Kampf and The Words of My Mouth and The Meditations of My Heart (which is his final book, about convalescing after glioblastoma removal and during cancer treatment). Below the poems is part of something I wrote the morning after I heard that LD was no longer among us, that my colleague and friend would write no more. However, I’m sure he’d be amused to see that he left enough work to keep us busy and edified for quite some time. 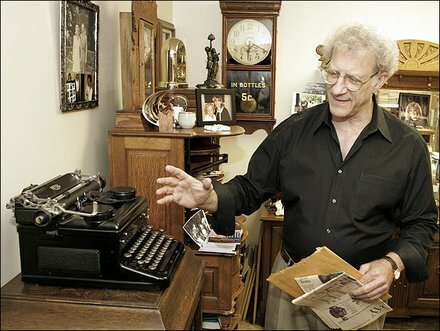 Brodsky showing one of William Faulkner’s typewriters at Southeast Missouri State University’s Center for Faulkner Studies. That others might know his flown soul. This time inside the mind of a falling raindrop. Meditation #196: Where Would We Be Without “It”? From the right temporal lobe of my brain. Indefatigably fatigued, fagged out, for the life of it. “Where do you get off with a meshuggeneh name like Methuselah? Knowing the whole audience knows ‘it’ is it, which is death? And then he farts, ‘It’s a goddamn shame, I tell you. I could never compose something true to life. All of these polarities need each other, to achieve completion, closure. “Immortality” needs “mortality” and vice versa – get it? Rigor mortis? Imagine if we could outlive our souls. We’d always reach eternity way too late. Lord, thank You for Your unique creation of death, in the beginning. We’d not know what we were missing of the premise of Your Promise. Kreplach, gefilte fish, derma, kishke, tongue, schmaltz? From a Goliath-sized seltzer bottle. Grotesque! Obscene! Horrendous! Horrific! Abominable! Heinous! Despicable! Cowardly! Repugnant! Intolerable! Crazy! Lunatic! Mad! Sick! Insane! Create colossal chaos where order thrived. Cant from our spiritual leaders. We’ve faithfully relied on the power of the word. To the deepest reaches of speechlessness? Cutting our tongues off would hardly be enough. Guided by instinctive reptilian design? Don’t end their plodding existences flattened? The inarticulate innocence of determination? Or stopped in our tracks by anthrax or smallpox. I feel palpable sadness, weep real tears. Resigned then, as now, to having to go home. Seem to bedevil my spirit more readily, of late. Why departures keep cutting closer to the heart. For my soul to grow, with the water from its tears? You never knew or cared exactly where you were. And won the gold medal. A Jew with a Teutonic tattoo. Isn’t all it’s cracked up to be. You know. Ringing up cutlery, men’s suits, power tools. And you long for another victory, in your defeat. The demarcation of weeks into days means nothing. Destined to line its nest, beyond forever. Memory and forgetting, life and demise. Such is the mist in which your oblivious spirit operates. That you’re a recluse is obvious enough. Destined to line the nest of the crooked-wing eagle. At eighty-eight, you have some right to complain. The past sixty years would have spared you this death. Protected me from death’s saber teeth? A sheer matter of simple, godless probability? From the roll call that devoured Europe’s 1940s? To express my ineffable perplexity? Created poems and paintings, dreamed millennial Reichs. I’m very sensitive to the rain. Tonight’s drops remind me of bleeding glass. Expired with the rest of my family, my people? Ask the rain. Maybe it can tell you why I’m still here. A star illuminating the cosmos, with its lambent light. Know, authoritatively, of what I say, speak, postulate. Like a belladonna, datura, nicotiana, paper-white. To let now subsume no, for the rest of man’s destiny? The following is part of what I wrote the day after I heard of LD’s death. Resurrects its devoted novitiates from earthly notions. It’s given dignity and purpose to my anonymity.